Up and down South Mesa/Shadow (Towhee was really muddy); still a few inches of snow the last few hundred feet to the top. Tue-AM: 1:33, 3000' ~ Green Mt. Kind of a convoluted start to the morning. At the last second, Joe and I decided to head up the Saddle Rock trail to try and scramble the Gregory Flatironette to the top of the Amphitheater trail. On our first attempt we were on a rib of rock too far west; dropped all the way back down to Gregory and then negotiated a rib that was too far east. Finally worked our way over to the actual GF for the last hundred feet or so. Looks like a nice line if you get on at the bottom. From there, Joe ran down Amphi (tapering for Zane Grey 50) while I ran to the summit, heading up SR-Gman and descending the 1st Saddle before running back down to Pearl. Up and down 3rd access. 36:30 PR from Chat to the summit, which was weird as I wasn't putting in a particularly focused effort and had a sluggish start being almost a minute slow to the base of the 2nd Flatiron. Round-tripped in 57:28, after which I put in 10min of barefoot on the Chautauqua lawn. Thu-AM: 1:18, 3000' ~ 2nd Flatiron+Green Mt. Up 2nd, down 3rd access. Mostly stuck to hiking today. Snuck in the odd running-like step here and there on the way down. Fri-AM: 1:00, 3000' ~ 2nd Flatiron+Green Mt. Up 2nd, down 3rd access. Met Dakota at Chat and headed up. Running when the terrain allowed. Afterwards, headed to Eldorado Canyon for some climbing. Dakota led like a champ while I flailed on top-rope. Sun-AM: 1:21, 3000' ~ 2nd Flatiron+Green Mt. Up the 2nd and down 1st Saddle. Continued perfect weather. I'm really looking forward to getting an in-depth gait analysis at the Boulder Center for Sports Medicine this week, as I think my mechanics (along with my admittedly undisciplined enthusiasm, i.e. boneheadedness) are the root cause of the frustration with my shin. Hopefully something is picked up on there, and I can come away with a specific plan of action for correcting some strength/flexibility imbalances. Base of the 2nd Flatiron: start of my usual scramble en route to the summit. Green Summit #100 of 2012. Mon-AM: 1:09, 2500' ~ Green Mt. Up and down 1st Saddle. Drizzle and graupel means I had the trails to myself. Only 4hr of sleep due to jet lag. Hiking. Tue-PM: 1:20, 2500' ~ Green Mt. Up and down 1st Saddle with Scott. Afternoon ascent because jet lag caused me to frustratingly sleep in this morning. Weather was a rain/snow mix and there was 3-4" of snow on the summit. Casual pace, hiking. Wed-AM: 1:19, 2800' ~ Green Mt. Up and down 1st Saddle. Snappy legs, but the snow slowed me down on the top half of the mountain. Ran to the trailhead, hiked up the mountain, then ran all the way home. Shin cooperated, which was fantastic. Thu-AM: 1:16, 2800' ~ Green Mt. Up 3rd access, down 1st Saddle. All running except for from the base of the 2nd Flatiron to the summit (most of which I wouldn't be able to run even if healthy). Shin was solid. Fri-AM: 1:17, 3000' ~ Green Mt. Up and down 3rd access. 36:55 ascent from Chat, which I think is quite close to my PR on this line, but this didn't feel that focused. Ran everything again, except for the goat sections on the way up. PM: 1:04, 2000' ~ 2nd Flatiron-Flagstaff Mt. Biked to Chat and then ran to the base of the 2nd with Buzz Burrell, Dave, and Dan Brillon. Scrambled the 2nd with Buzz and Dave, met back up with Dan, and then made our way over to the summit of Flagstaff. Met back down in Chat for Caballo's memorial. Really quality evening in the hills with good people even though I knew I was overstepping the capabilities of my shin a bit. Sat-AM: 1:09, 2500' ~ Green Mt. Up and down 1st Saddle. I knew my shin would be tweaked after yesterday, and it was, but not terrible. Biked to Chat and just limited myself to hiking. Sun-AM: 1:25, 3000' ~ 2nd Flatiron+Green Mt. 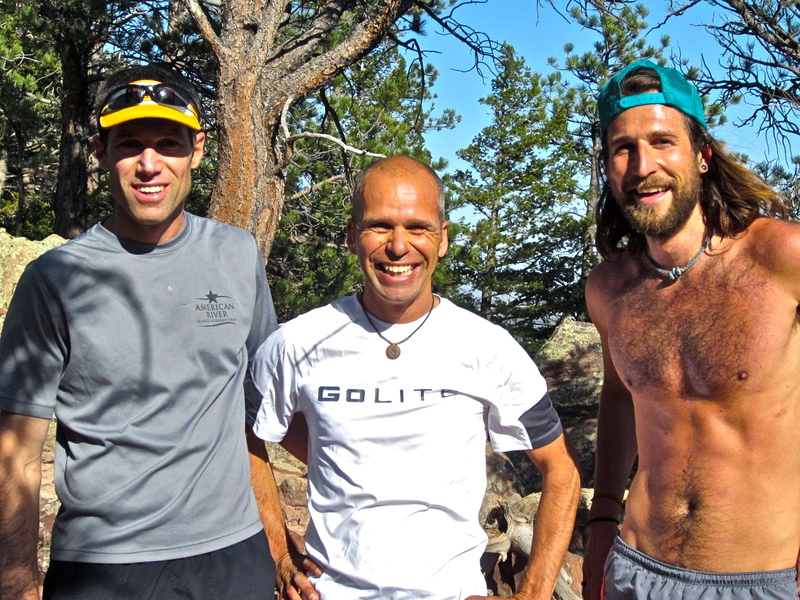 Biked to Chat with Joe (running beside), hiked to the base of the 2nd, scrambled straight up the face, and bumped into Andy Ames and Bernie Boettcher (a pair of mountain racing icons) before heading to the summit. Shin was noticeably better today but I kept it to mostly hiking on the downhill, too, where we crossed paths with Dave and Jeff heading up. Glorious day on the mountain. After 10 days off and four days of hiking, I tried very hard this week to not get over-ambitious in the spectacular spring weather Boulder has been experiencing, but Friday evening's outing was inevitable with the gathering of friends. I think I was able to avoid a serious setback with the shin, though. My plan/hope now is to abandon any immediate competitive ambitions and just listen very closely to the shin. I need to remain content with 60-90min outings for a long time, even if the shin is feeling great. I know I still have time to get ready for Hardrock if things fall into place (I'm not in terrible shape right now), but I'm mentally preparing myself for having to sit out that classic, if need be. I won't race Hardrock if it means re-injuring the shin; I still have faith that it can happen, though. At the First Flatiron saddle with Mr. Mackey, Dan, and Buzz (behind the camera) Friday evening. This video gives a great overview of the Tarawera Ultramarathon down in New Zealand--fantastic people, flawless organization, unique and high quality trails; I definitely plan on being back next year. Also, a big congratulations to Kiwi Vajin Armstrong for a convincing and impressive win at the American River 50 this past weekend. Vajin is one of the nicest dudes I've met on the circuit, and I think it's awesome that an international runner came over to win one of North America's spring ultra classics. Anyone who has seen the Manitou Incline knows how impressive Ed's mission there on Saturday was. 1mi/2000' ascents (and descents! ouch!) with most in the 27-33min range. Pure nails and super inspiring no matter what age, let alone 58. I've listened to this dozens and dozens of times already (new song starts at 3:45). Can't wait for their new album to come out in June!